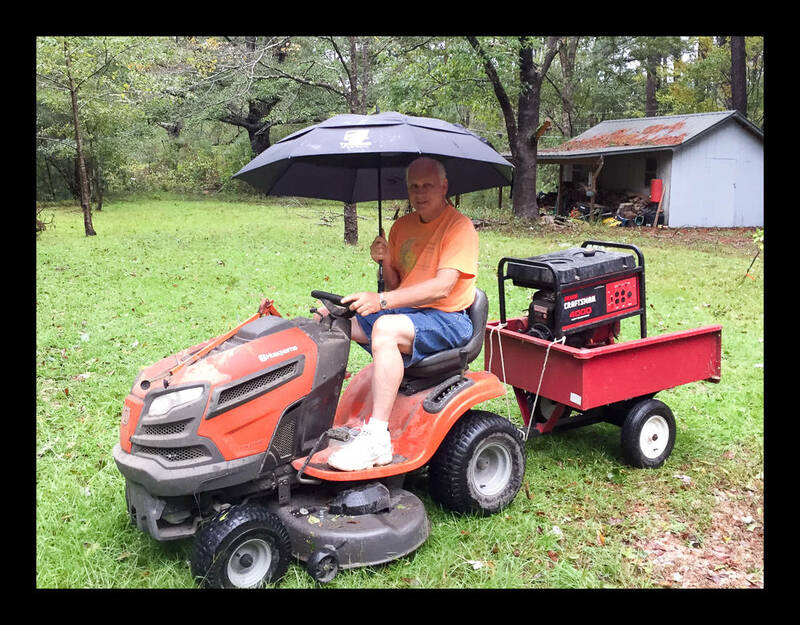 I had a friend who bought a generator because the hurricane was coming to town and one was available, and had no idea what to do with it. My goal with this article is to tell him what I wish I’d known a year ago, before Matthew killed my power for a week. After actually getting to test my setup with a real power outage, I feel qualified to do so. So, why bother with a generator in the first place? I work from home doing stuff that requires computers and Internet access, on a power line that only feeds three houses. 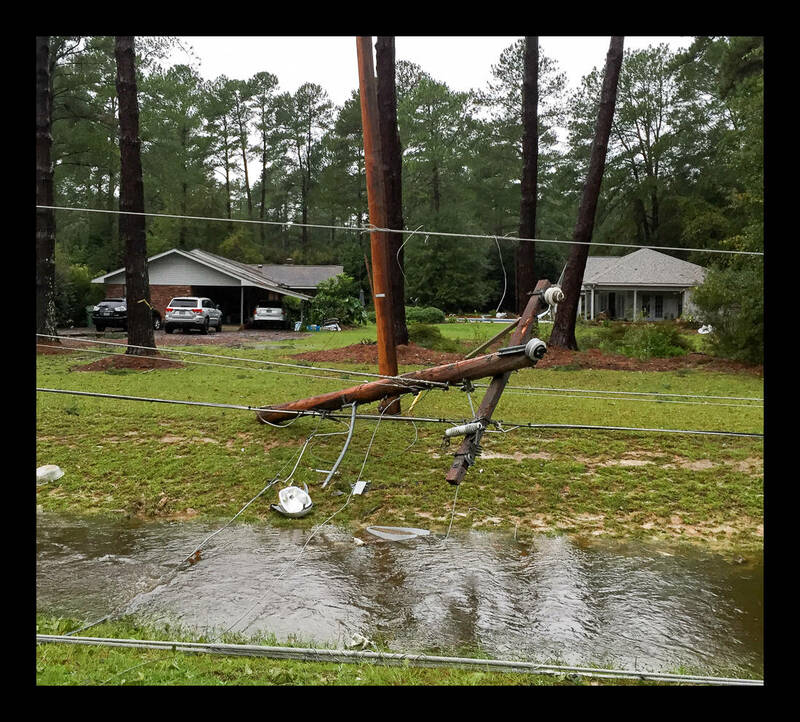 When power is out it’s restored based on the number of homes affected, so we’re at the bottom of the list for service restoration, especially when the problem affects just us, like this photo from Matthew. We lost power for seven days. I also have fiber to my house providing telephone and Internet access (which is run under the ground! ), so Internet access is probably still available even when the power is out. Wiring the house for backup power means I can continue to work and watch the news for weather updates and what-not. The best way to solve this problem is probably to buy a big, fancy generator capable of running the whole house, that comes on automatically, tests itself every week or so, is attached to a big tank of propane or diesel that will allow it to run for a week unattended, and that sends a text or e-mail message if something’s wrong or the fuel level is getting low. We were checking the oil every 2 hours because consumption was high, but that wasn’t enough. 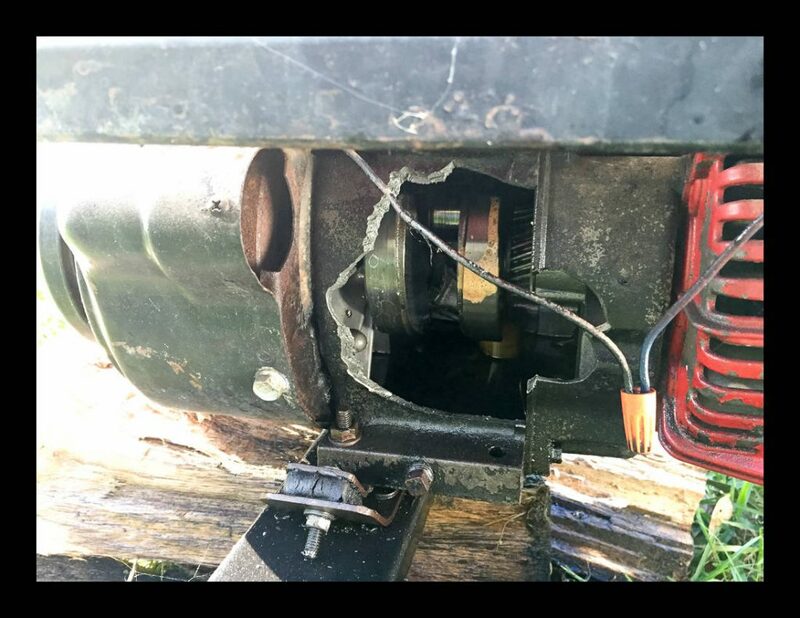 For readers who are not mechanically inclined: this generator is no longer capable of producing power. Figure out what you need to run for an extended outage. I used peak load to size things as being more conservative seemed the smarter choice, and because peak load numbers were easier to find. In hindsight I’m not sure this was correct, as I found with everything turned on I was consuming a touch less than 1000 watts constant draw. Granted we use LED lights instead of incandescents on the circuits powered by the generator, but I was surprised how low the draw actually was. I ended up buying a Yamaha EF7200DE. If you search that you’ll find that this is marketed as a 7,200 watt generator – it’s even in the model name. I think that’s deceptive, but it’s the way all generators are marketed so it’s one of those things you need to know and take into account while shopping. This generator is actually rated for 6,000 watts continuous power, but spikes to 7,200 watts (20% more than the rated power) that last less than thirty seconds or so are OK and are within the design parameters. Choose your generator based on its continuous power rating, not the peak power rating. 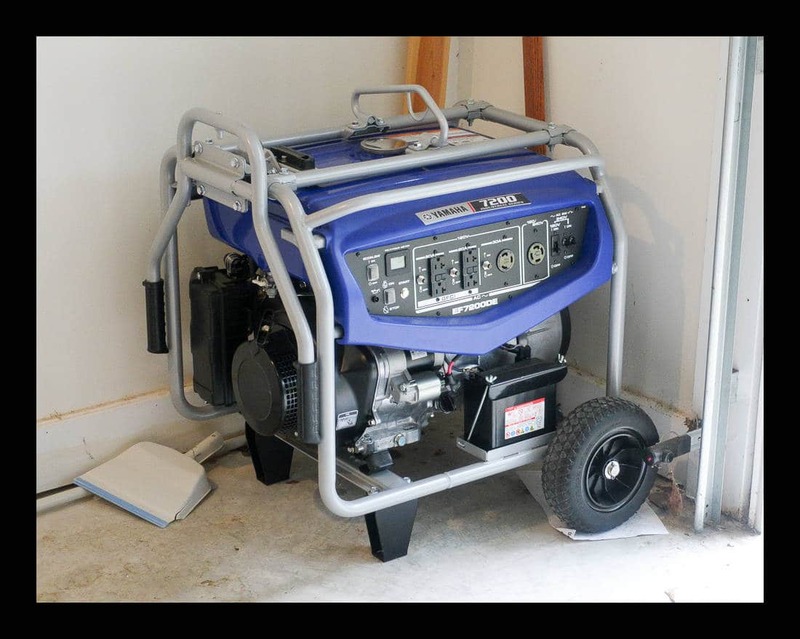 was the only generator I considered that offered a 3 year warranty whether it was used in the home or as an all-day-every-day tool on a construction site. This implied Yamaha believed in their product’s ability to hold up even to abusive use. 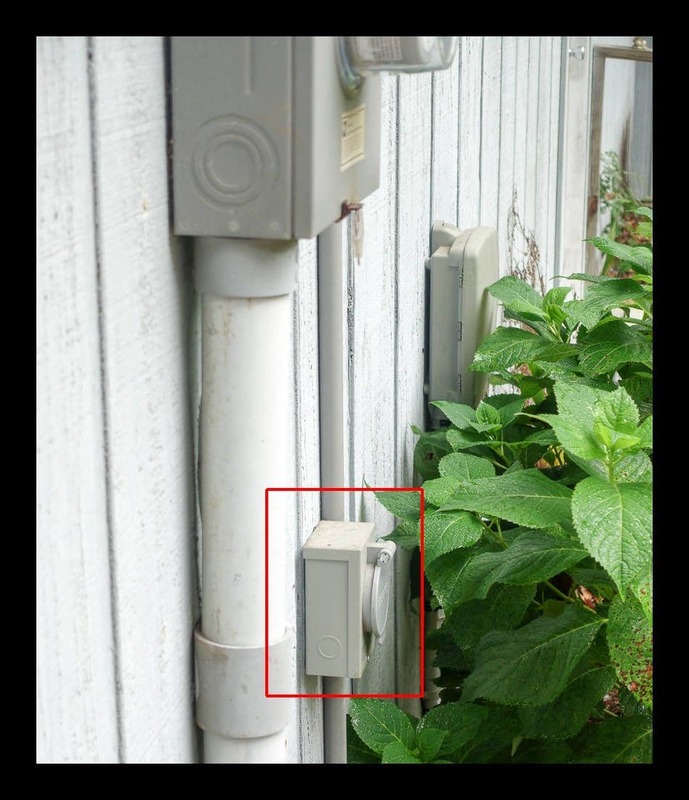 Has a NEMA L14-30 plug to connect it to the house. What convinced me was talking to the guy in the repair shop about generator quality. In his opinion Honda and Yamaha were at the top of the reliability ratings, with a very long gap before the other brands. In his opinion if you could afford it you bought one of the Japanese generators, and if you couldn’t then the rest were about the same reliability-wise. Since the number one criteria on this purchase is that it provide power when necessary, this convinced me to spend the extra money. Of course, the counter-argument is that if the generator at the local home store costs half as much as the more expensive Japanese brand then you can afford to have it serviced or replace it in a few years and still come out ahead. I agree, but after years with expensive hobbies one of the lessons I’ve learned is “buy once, cry once.” In general I believe I can spend more up-front for high quality, maintain it well, and do better over the decades than if I buy something of lower quality. Your opinion may differ. The only bad choice here is buying a generator that won’t meet your needs. 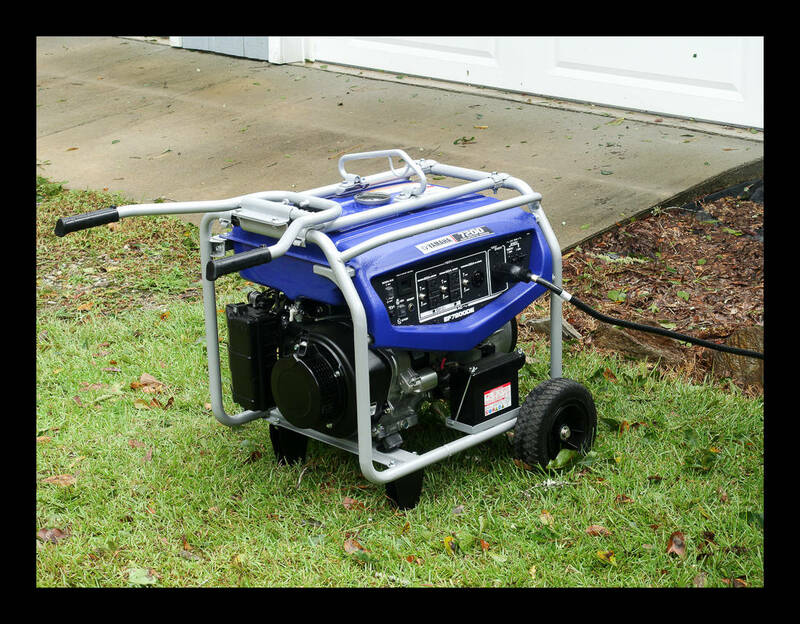 You’ll find like my friend that generators are mostly useless if you don’t have a way to make use of that power. You can run extension cords over the house through half-closed doors and keep essential appliances running, but that’s a poor solution. A better solution is to run the generator’s power into your house so you can just use the appliances you need like you always do. What you don’t want to do is set up a situation where you run backup power and end up energizing the lines upstream of you, causing a hazard to electrical workers who think the lines are dead. So if you search the web you’ll see instructions that show how to modify the outlet your dryer uses so you can plug your generator in there after turning off the main circuit breaker and those circuits you don’t want to run. This is inexpensive, but it’s also one of those things that seems really easy to screw up, especially when you’re already stressed, dealing with stuff you didn’t think you’d need to deal with (like the trees that landed on your house and truck), or when someone less astute has to turn on the generator because you’re not around. It’s better to set up a system that’s idiot proof (at least as far as lethal consequences for screwing up), and that’s a transfer panel. This is where your generator will plug into the house. Yes, it’s a canted a little. Yes, it works fine. Basically, what you’ve got is a box with 10 or so 3-position switches. You’re inserting the transfer panel between your appliances and the breaker panel so the transfer panel can take control of those connections and switch them to generator power when you tell it to. 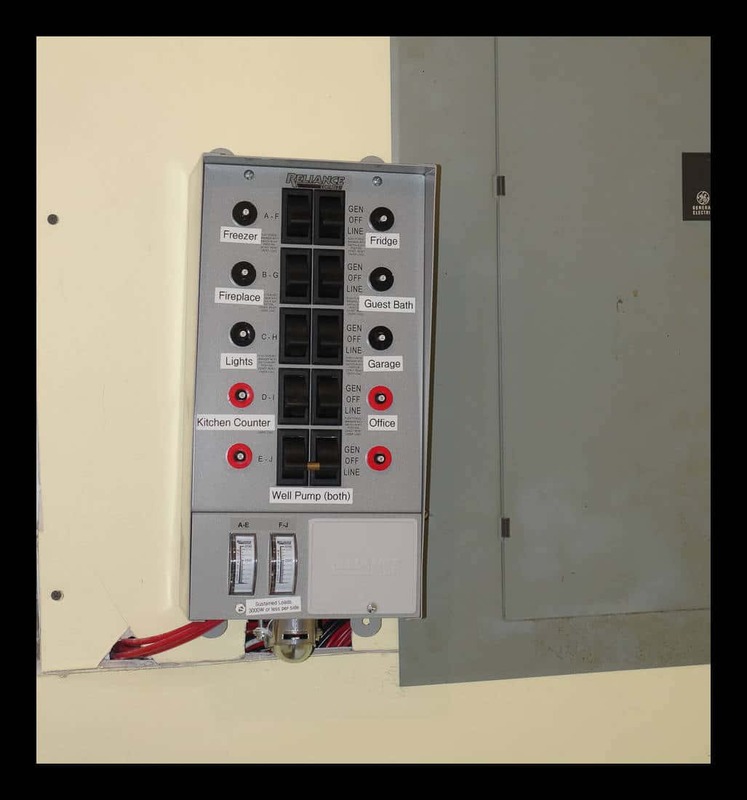 Most of the time you will have the transfer panel switches set on ‘LINE’ because you’re using power from the power company. When you switch to ‘GEN’ the transfer panel is setting that particular circuit to draw power from the generator instead. Simple to do, simple to understand, and no risk to the electrical repair people. When the power comes back on the appliances running on generator power will continue to do so until you manually switch it back. 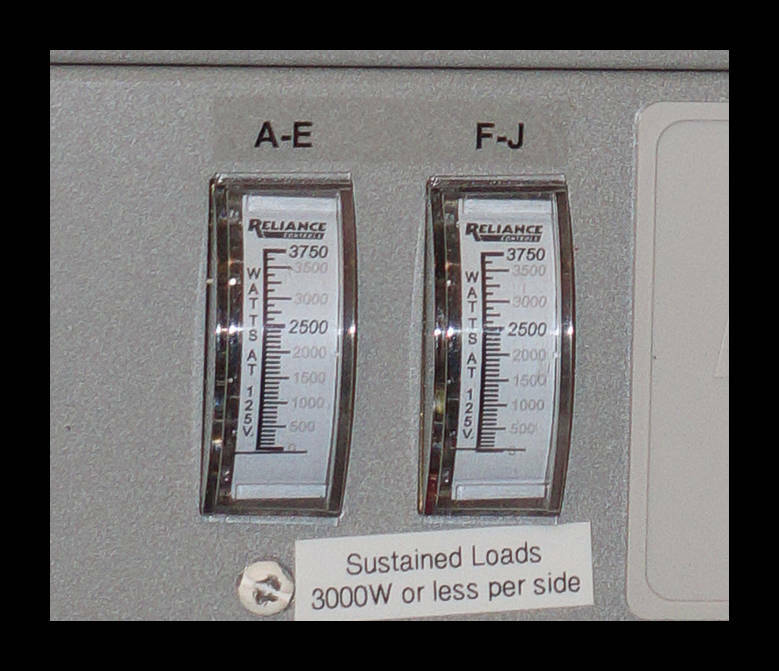 Those gauges tell you exactly how many watts are being drawn from the generator for switches A-E (left side) and F-J (right side). It is worth the effort to try and balance power consumption between the left and right switches when deciding which circuit to apply to each switch, as your generator can’t supply more than half of its power per side. This also helps when powering circuits up because a number of appliances will have a very high initial draw that will dip down to something more manageable after a few seconds. Watch the gauges to insure the initial load spike is over before switching the next circuit on. I chose a 10 switch transfer panel because it was the largest I could find. I’m happy with it, but if I’d had 12 switches I could have wired up a hot water heater too. Even if I had to turn off the well pump’s 240V connection in order to switch on the 240V connection to the water heater it would be nice to take a hot shower. As it is we have cold water, and bathing means pouring hot water into a tub and taking a bath. I’d rather have hot running water, but this is better than wet wipes. 14 switches means I could also choose to run the HE washer and dryer, even if it means turning other circuits off to save enough power for it. 16 switches and I’d have two bedrooms with functional ceiling fans, and two bathrooms with lights and fans that work. There’s value in more connections, but as it is the 7500W rated panel I installed makes my house livable when the power lines are down for weeks. That just doesn’t mean things are optimal. What about an interlock instead? You aren’t limited in the number of circuits you can power through it. It increases the complexity quite a bit. then flip switches on the transfer panel. I like simple solutions that are hard to mess up, though the ability to run power to additional rooms and even run a hot water heater in an extended outage are appealing options as well. As an aside, I bought the EF7200DE and learned it had a bonded ground, because apparently that’s required by OSHA. I wasn’t certain that this was compatible with the transfer panel I bought, but it turns out it was no problem. Or at least the tech support people at Reliance said it was fine, and it works great. Irma came through and was projected to be catastrophic, but we ended up seeing much less damage than we could have. Still, power was out for an evening so I got to test things our and see if everything worked as well as I thought it would. Overall: everything did great and things ran according to plan. We have one light fixture with older low power consumption bulbs that flickered on generator power, but other than that everything ran fine. On initial power-up I flipped the transfer panel’s switches on one at a time, and waited until I was sure that power loads were past their peak before moving on to the next switch. I saw one peak to 2,500W on power-up, then back down and everything else was fine. Overall draw with the big TV, overhead lights, wifi and Internet, fridge, chest freezer, dehumidifier, overhead lights throughout the house, and one computer running was around 900 watts. That left plenty of room for the well pump, microwave, coffee maker, toaster, and other appliances to draw power as necessary. The generator has a 6.9 gallon tank, which is supposed to run 8 hours at full load and 12 hours at half-load. I never got a chance to find out what it will do at 20% load, but I’m guessing it would be 14 hours or so. Certainly long enough that I can simply refuel the generator twice per day if I want it running around the clock. I will note for others that live in the humid South that the dehumidifier had a surprisingly huge impact on how hot it felt inside. We can’t run the heat pump on this size of generator, but with humidity under 40% you don’t really feel like you need to. You know what it feels like for the week after a hurricane hits without any power – it’s just intolerably hot and humid most of the time. I think the addition of the dehumidifier makes living under generator power much more pleasant. I need to come up with an improvised shelter for the generator that’s easy to store. Generators generate enough carbon monoxide that they’re not safe indoors (or close to indoors), and the generator itself isn’t waterproof. After the power outage I waited until the rain mostly stopped before pulling the generator away from the house and cranking it. I had to take cardboard box and rig it to protect the outlets and switches from intermittent rainfall. When I get a few hours I should be able to devise something that stores well, will protect the generator from rain, directs generator noise away from my house and the neighbor’s house, and provides enough airflow for cooling. But overall? This worked great, and I’m glad we have the setup we have. This entry was posted in Be Prepared by Derek Zeanah. Bookmark the permalink.